Provide comfort for the family of Austin Burberry with a meaningful gesture of sympathy. 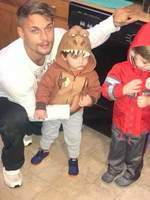 Austin Dodd Burberry, age 24, son of Dwayne Burberry and Heather Alayne Wells Burberry, died on Sunday, March 3, 2019. Austin was a 2012 graduate of Bourbon County High School and attended River of Life Ministries Church. Besides Austin’s parents, Dwayne and Heather, he is survived by his children, Brendan Michael Wayne and Connor Dodd Burberry, a fiancé Bailey Ann Rainey, paternal grandparents, George Thomas Burberry and Vera Rankin, maternal grandparents, Gayle Wells and Anne Hunt. Also surviving are his brothers, Drivers Burberry and Dillon Burberry as well as a host of cousins, nieces, nephews, aunts and uncles. The funeral service for Austin Dodd Burberry will be held at 11:00 a.m. on Friday, March 8, 2019 at Rivers of Life Ministries Church with Pastor Krista Hampton officiating. Interment will follow in Old Union Cemetery with casket bearers being Christian Braunig, Chris Porter, Jaylen Owens, Frankie Sanders, Jacob Day, Danny Gutierrez, Drivers Burberry and Dillon Burberry. Honorary bearers are Jurney Owens, Thomas Burberry and Tyler Wolfenbarger. The family request visitation between the hours of 5:00 p.m. and 8:00 p.m. on Thursday, March 7, 2019 at Rivers of Life Ministries Church. To send flowers in memory of Austin Dodd Burberry, please visit our Heartfelt Sympathies Store. Provide comfort for the family of Austin Dodd Burberry by sending flowers. Austin you where am amazing person! I can’t believe you gone! We had msj on fb a couple of weeks ago I can’t belibe you’re gone. I’m glad that the few times I got to hang out with and your friends where fun! I know you love tamales! Fly high my man!